Ask anyone to name the greatest entertainer of the 20th century and responses will likely range from Sinatra and Garland to Elvis and Aretha. Chances are Bing Crosby will rarely, if ever, be mentioned. At his height, Crosby was untouchable, the world’s first multimedia superstar; but after his death in 1977, age 74, his star faded quickly. Fortunately, back in 2001, esteemed jazz and film writer Gary Giddins set out to fully chronicle his tremendous heft, publishing A Pocketful of Dreams, spanning Crosby’s first 36 years, from his early days in Spokane to his rise to the top of the Hollywood heap. Expectation was that Giddins would shape a companion volume covering the rest of Crosby’s life. Instead, part two of what will ultimately stand as the definitive Crosby analysis and appreciation covers just seven years. 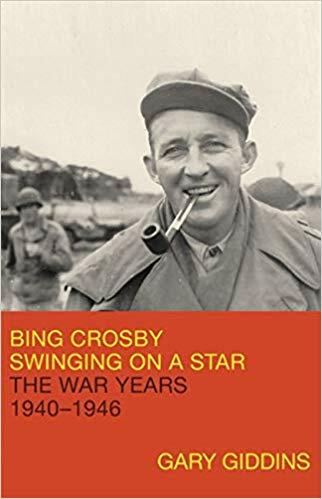 As Giddins so superbly demonstrates, more than any other period, the stretch from the early- to mid-1940s was not only Crosby’s most influential but also served to shape a canonized public persona that lasted his lifetime. Giddins does include personal details, particularly Crosby’s challenges with wife Dixie as her alcoholism and reclusiveness spiraled. He also confirms that Crosby was a strict disciplinarian to his four sons, though hardly the tyrant he was later painted. But Crosby wasn’t home much. When not in near-constant professional demand, he savored time alone. Giddins painstakingly dissects every recording session, every film. Though Crosby scored a remarkable string of hit records, including the landmark “White Christmas,” Giddins notes their frequently lackluster quality. Unlike Sinatra, Ella, and others, who would hugely benefit from masterful arrangers like Nelson Riddle and Billy May, Crosby was primarily partnered with the comparatively pedestrian John Scott Trotter, both in studio and for radio’s massively popular, Crosby-hosted Kraft Music Hall. The quality of Crosby’s film output was more consistent, including his first four Road to… comedies with Bob Hope and Holiday Inn and Blue Skies with Fred Astaire. He was box-office champ for five years running (1944-48), a record since tied only once, by Burt Reynolds. No film role resonated more powerfully than his Oscar-winning portrayal of Father Chuck O’Malley in Going My Way (and the equally popular The Bells of St. Mary’s). O’Malley, aptly described by Giddins as a “superhuman fount of liberal wisdom, empathy and action,” helped cement Crosby’s indelible image as a man of the people—an impression powerfully abetted by his tireless support of the war effort, crisscrossing the U.S. to entertain at bases, hospitals, and bond rallies, then traveling to England and France in 1944. By war’s end, he was, apart from the late FDR, America’s most admired figure, a bonhomous everyman. Everyone thought they knew him. Few really did. He never encouraged close friendships, describing himself as a “cool customer.” Even Hope, for all their buddy-buddy clowning, was little more than a valued colleague. As Dinah Shore observed, “Bing was great [but] he wouldn’t let you see that deeply into his soul.” Giddins may be the first to penetrate soul-deep.